We all remember 'Man of Steel', which to date has received mixed opinions from everyone. 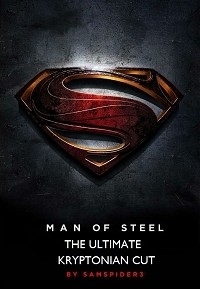 We have found people that say it's the Best Superman and Best superhero movie ever made, to others it's total garbage. I actually believe the film is decent, but I was disapointed with the final result. I was disapointed at how the story was developed and the way the movie was edited felt kind of slow, especially when we see Clark's Journey. So this way, it will seem more interesting. Also, yes, it's the movie that shows a good fight between Superman and his enemies, but I felt it was too noisy and chaotic at some points, so I tried to cut some little things to make the battles and action sequences less destructive. I can't do miracles, but I think it's way more watchable this way. The most important part in this Fanedit is the scene were Clark finally puts on the suit and decides to become Superman. This was my ultimate disapointment in the film because I was expecting such important scene to be in an iconic point, but instead it looks kind of random. So, in my Edit, Clark will put on the Suit when he feels he needs to. MWRK for his wonderful tips. I have learned a lot because of him. Masirimso17 for his cover for this Fanedit. I used Sony Vegas 11 for this Fan Edit, but I made the first version 2 years ago in Sony Vegas 7. This project took 4 months to complete, but afterwards I decided to "remake" it, the base is very similar to my first edition, so it took me 2 days more. -Added a Man of Steel Logo at the Begining. No Titles at all. Similar to Batman Begins. -Colors were changed a little bit to look alive when the scenes include a vivid Sun or there is visible fire. Inside places have the original colours because of the poor lightning of the set. In my opinion, it's a very gray film. -Film opens with Clark saving the workers in the Oil Rig as we will see everything through his eyes. -Jonathan Kent does not die because of a Tornado. His death is revealed at the end of the film and the reasons are unknown. You can assume he had a Heart attack as the original. -When Clark asks what he was supposed to do when the kids of the bus were going to be drowned, Jonathan does not reply "Maybe". I thought it was kind of a douchey answer. I cut it and we continue to the part where Jonathan says Pete's Mom was scared. -Clark's Flashback were he is being beaten by kids was added to the scene of the Bar. I feel it fits better. Also, Clark does not destroy the truck. He respects his father's advice. -Krypton opening was moved to the part where Jor-El talks about Krypton's fate and was cut as much as possible to make it seem as a flashback. -Lois does not investigate Clark's past. In fact, she doesn't know his real name until the end of the movie where Perry introduces him to Lois. -Clark comes back home after Jor-El explains about his past. He does not put on the suit. -Clark puts on the suit after he talks with the priest in the Church. This way, it will seem like a more iconic moment. -Clark tries to Jump and unexpectedly, he "floats" but falls after that. He decides he could fly after remembering his father words: Keep testing your limits. -Lois will go with Clark to Zod's Ship because she wants to. Not because Zod wants her in the ship for no reason. -Removed all the parts where Lois calls Superman "clark". -Cut some little things in the Battle of Smallville to not make seem like Superman or Zod's sidekicks are causing too much destruction. -Cut some of the destruction from the scenes of the World Engine and the Jets trying to destroying it. -"Krypton had it's chance" was cut. I felt it made seem Clark very douchey. He is now decided to save earth and nothing more. -Another thing: The romance was cut because it had almost no chemestry, so... no kiss. -Some little things in the final Battle were cut for the same reasons above. -Zod trying to kill the people with his ray vision was cut a little bit to make it seem faster. The original scene was stupid. Those people acted like they had no chance to escape and the ray was going to them in slow speed. Instead, the ray will go to them as fast as possible. -2 years have past after the battle of Metropolis. -"You will help them accomplish wonders" speech was added at the end of the movie to give it a Dark Knight feel. This is the first edit I have seen of samspider3 and being a huge Superman fan I must say CONGRATULATIONS, this edit is awesome, I really enjoyed this. Just the first image when I saw the variation of colors and how vivid the film is just made it better for me instantly. The transitions in editing are great, the development of the character and the tone down of depression and violence was really rewarding, thank you very much for this edit, it really made my day, I can guarantee multiple views and recommendations. This will be my first ever review, but I can say I am glad I joined this fanedit community. These edits put new twists on established stories and often they are better than the originals. I can say samspider3 does a great job of cutting down some scenes or minor rearrangements of scenes that, as he says in his fanedit description, tells the story from Clark's perspective. The original beginning of the movie (Kal's birth and the conflict between Zod and Jor-El) have been to fit in line with Clark discovering his birth father on the Kryptonian ship and views Krypton's last moments as a greatly shortened and better suited flashback. I thought this was a good idea as well as other minor alterations through the film. Oh, I also really liked the now new flashback scene when Clark visits the Pastor in Smallville and the cut to the Tornado and Jonathan Kent dying. Great cut Samspider3! Much better done here than in original movie. In this cut, we don't know Jonathan is dead yet until that scene of the Tornado and by connecting the Tornado with the church scene, Samspider3 has given this scene even deeper meaning: 1) Clark seeks council and would have gone to his father, but his father is dead. and 2) This is Clark coming to a crossroads between the shadows where he has always kept himself as he is an alien and now being forced to reveal himself to the world for the good of the world. Well done! 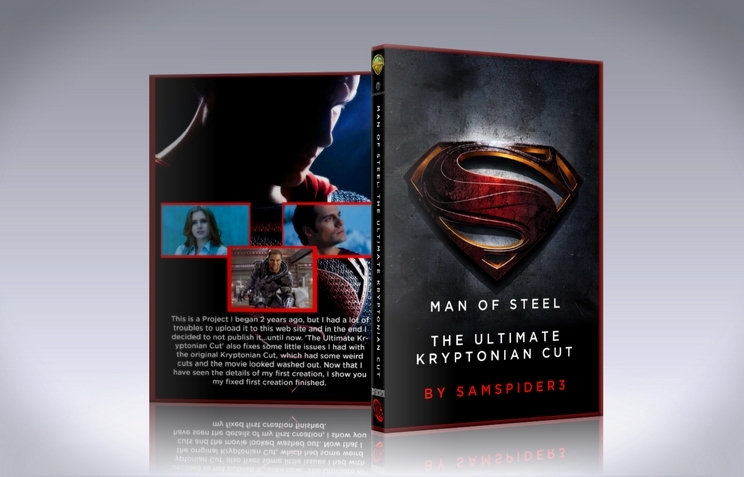 As I watched samspider3's edit through Clark's eyes, I noticed though the story telling may be tightened up, as big as a fan I am of Man of Steel (I do really like, I always like new takes on established characters, and it fits really well with Batman v Superman especially if you want the fan edit version told from Clark's point of view) the emotional investment in Clark is still not the nice likable character Christopher Reeve's interpretation of the character. This is perhaps often the biggest complaint of this movie itself (and has nothing to do with samspider3's cut, which is a very good version, thanks samspider3!) that fans of had. And as I said before, I like this interpretation of the Superman story as Nolan and Snyder seek to answer the question what would really happen if the world discovered a being who could do these miraculous feats? Growing up with Reeve's and Welling's Smallville versions of Superman, we see not an alien, but a being of absolute good (and almost too good-natured) who always smiles and everyone is amazed by first and foremost that character's self-sacrificing nature. He is a reminder he is part of the human race and does it gladly and freely. The fan leaves the original 1970's movie inspired, now believing him/herself can and should be ready to prepare for the good of humanity. In Snyder's take, that self-sacrifice is subtle and subservient to the idea Clark must also keep himself hidden as his alien nature itself (which is not the focus in other interpretations as Clark looks human and as such no one cares since he is basically human) may alarm the world. Snyder's take is more about answering the question would the world really be ready to accept the truth if we knew an alien was among us? In a sense through the original movie, we as the audience are the world, we are introduced to Clark just as he is about to appear as Superman (in the original movie) and must trust him even if we have not quite yet developed that trust in the character in spite of the marvelous feats we have seen him perform in the flashbacks of his childhood. We are forced to trust him as opposed to knowing we can trust him because we know how he grows up. Watching Smallville and the Reeve's Superman movies, we don't see an alien, we see a human amazed at the wonder of his own abilities, we see it not through his eyes but our own as we would like to believe we would react the same way given those exact same abilities. We see glimpses of this throughout Snyder's interpretation, especially when Clark discovers he can fly immediately donning on his Superman suit, but as I said before, we do not experience this wonder and develop a trust throughout as we are almost immediately expected to trust him from the start. It almost begs the viewer to answer the question: just because someone can do this, should I trust him? It makes me wonder if Snyder is telling me yes, I see it, therefore I have to (without knowing Clark's background and good-natured heart), I must trust him because of his abilities and strength, not because I know he is a good person. As I watched this really good cut, I noticed one of the biggest cuts was Lois's detective work in discovering Clark's identity. Knowing samspider3's cut is intended to view the experience through Clark's eyes, it is understandable that he would want to cut out Lois's journey as it really is the same story twice. And as I watched it, it occurred to me there should be a Lois cut! And not because we should write it from each character's perspective (heavens no! ), but because you could actually start the movie with Lois going to the ship and through her detective work, go back into time discovering who this might be (and with her, as she visits each place as she did in the original movie, we would live through the flashbacks of Clark). We would travel back in time through Lois to essentially Clark's arrival on Earth and answer the question in a better fashion: why haven't we heard of this Superman before if it was apparently so easy for Lois to find him? The answer is, there is so much hog wash in the news, what are we to believe and until you actually see it, would you really investigate it? So, starting the movie from Lois's unique perspective as being the only reporter on site, she has key evidence that an alien being actually exists, and will discover these wondrous feats he has accomplished on his time on Earth. We might actually trust in Clark more in this case, especially, as I noted above, the audience is being asked to trust him without going through his shoes in the same fashion and enjoyment and amazement as we were asked with Reeve's Superman. From Lois's perspective, you would essentially go from one mystery into another and not have them overlap. In essence, Act 1: Who is this mystery guy from the world's perspective? to Act 2: Now we know he is a kid from Smallville, an alien, and he has been asking the same question and now he is getting his answer and we get to discover it with him. You could tell the story backwards until she meets Clark in Smallville, then we are in the present and resume with the rest of the story. We could have them meet at Jonathan's grave, then Clark go visit his mother to tell her the good news about discovering his people, stick around the farm that evening to celebrate and long enough to receive Zod's worldwide TV message, and then go back to the ship and have Jor-El tell him more about his past making the message of Zod and his coup even more sinister to samspider3's cut of going to the pastor to ask for advance (flashback to death of adoptive father) and finally CHOOSING to don the suit of hope/Superman as an earned or chosen act instead of just simply a thing he does as presented in the original movie. I just found out that these fanedits exist and sadly I don't have the time to invest into making these cuts, but it would be awesome if someone could! Thanks samspider3, I love these fanedits, they really make you think about storytelling and I enjoyed every minute of it! I went to see this movie in theaters knowing it had recieved terrible reviews. I didn't care. I was so excited by the trailers, I was ready to give the movie every chance. I loved the Martha and Jonathan dialogue bits. Young clark running around with the cape tied around his neck. I don't know if I've ever been more disappointed by a movie. This edit doesn't seem that different from the theatrical release, but at the same time, it flows so much better. The Lois and Clark scenes feel way more cohesive. And as much as I liked Kevin Cosner, the way this edit handles certain events that happen to him is MUCH better. The 14 hour long fight sequence between Zod and Sup is no longer exhausting and boring. I'm not sure how the theatrical version made it boring originally or how this edit managed to make it actually feel interesting and add a sense of danger to the battle, but it did. Apparently multiple subplots were nixed because it seems so much more focused. I wish Snider could see and learn from this because Superman v Batman looks unfixable to me. When he tries to jam so much into a movie it just ends up feeling like a rushed mess. Bravo on this edit of Man of Steel. It actually feels like a Superman movie. I still hate the tone shift going from Lazer Eye Zod to snarky drone-killer Superman but there literally is no way to fix this. Technicaly I was amazed. Everything seems to flow very smoothly. Usually in edits are a few hard cuts but not noticeable here. It has been a long time since I saw Man of Steel. And I didn't go into this with high expectations. But this movie is transformed the movie experience for me. It is much more engaging theatrical version. I truly look forward to watching this again. How can I start? This is my first, proper review on FanEdit and I am thrilled. I will start by saying I have seen this fan edit long ago and is definitely one of the best I have seen until now. My premise is this: when I saw "Man of Steel" on DVD, I was definitely disappointed, as I hoped the film's cast and crew would bring the character in the same direction as Batman, having Nolan participate in the production. What of all things bothered me, though, was what I believed in "Man of Steel"'s potential sequences and foremost narrative, being able to deliver strong sequences and music which, although very loud, pretty strong, especially in some scenes. I am glad to say I was right in this, and thanks to Samspider3 I have my go-to version of the film, now strong, and which raises each sequence's value and importance. The flashbacks are wonderful, and the perspective is strong. The film starts in a way, with the oil rig scene, which just blows the viewer away. I agree the plot hole of having Zod want Lois Lane on the ship for pretty much other than no reason was pretty creepy, as is having Lois say "I'll go", which, although kind of anonymous, it just flaws on the screenwriters. This was the only 'nitpick' I had, also having the editor remove all of that bloated and exaggerated actions scenes, which were especially overlong and pretty much pointless. Now the film has a reasonable length and is what you would expect going in theaters. I do fear having the card read "Two years later" as well as having Lois Lane not knowing Superman's real identity will break continuity with the up and coming "Batman v Superman: Dawn of Justice", and, if it does... this will still be my preferred version of "Man of Steel". Stunning! Well done! A very good fanedit if I must say. I love how you restructured the flashbacks and narrative, and I love the transitions you added to the flashbacks, with the flashbacks audio playing in the previous scene right before they shows up, to signal a flashback. I will say the big thing that bugged me with the fanedit though was how some of the cuts with Lois kind of made her a walking plothole. For no reason she seems to volunteer and is allowed to join Clark on the ship as a prisoner, and after the Smallville battle, she shows up at Clark's house, even though she doesn't know the truth about him. I think perhaps you should have left her knowing Clark's identity in. A nitpick I also had is some scenes there seems to be some kind of screeching noise in the video, which should be fixed. The only other nitpciks with the film is in the intro, when the Superman symbol is shown, the water splashing is heard, and I felt it should have started with no water splashing and only started water splashing half way through. I know what sounds a bit silly to nitpick on, but it just bugged me. Still, a good fanedit of Man of Steel. Thanks a lot for your review. I appreciate it because it was a project I put a lot of effort, especially being the first Fan Edit I worked on. Let me tell you, I found it has a little bit more of sense showing Lois being volunteer to join Clark in Zod's ship instead of that stupid thing of "we want this woman in the ship because we need something to make the story go forward". If you think about it, there is no reason at all to make Lois go to Zod's ship, it's not like Lois had some vital information or whatever, nobody questions her and nobody talks to Lois in the scene aboard Zod's ship. In the way I put it, it is a little bit more espontaneous. Oh and about Lois going to Clark's house, after so much disaster and a car being thrown to the farm, you could assume she heard all the mess and went right to the place where it was happening. The waves sound at the beginning was something I wanted to let because it was the first thing I imagined when i came up with the idea of making the Fan Edit and begin the film, and it was something I had in mind way before this movie was released on DVD.